Ever since Google Earth was first released, users have been spotting aircraft in flight in the imagery. When an aircraft is captured in flight in Google Earth it is not uncommon for it to have a second ghostly image next to it, or in some cases a rainbow effect. This is caused by the way satellite cameras are designed. Satellites have multiple cameras for capturing imagery in different wavelengths of light. A common setup is to have a high resolution monochrome camera and then a separate camera that takes photos with various colour filters in quick succession. The multiple images are then combined to form what you see in Google Earth. However, if there is a fast moving object in the scene such as an aircraft, it will have moved between exposures and the ghosting or rainbow effects can be seen, depending on what type of camera the satellite is using. In addition to the aircraft’s movement, the satellite itself is moving and due to parallax the aircraft will appear to have moved in relation to the ground. This often results in the multiple images being offset from the direction the aircraft is travelling in. The satellite took images in quick succession with blue, green then red colour filters, and finally a higher resolution image in monochrome. In this image, the satellite took the high resolution monochrome image first, and then red, green and blue colour filters. We don’t know how the double image of the aircraft tail happened. This image shows an aircraft and its shadow both exhibiting ghosting. Satellites are also capable of taking images in spectral ranges far outside the visible range such as in the infrared. These images have a variety of uses including mineral exploration, environmental monitoring, agriculture and military. Digital Globe’s World View 3 that was launched last year and whose imagery we recently looked at shows on its datasheet that it is capable of capturing a variety of bands in the infra-red range. 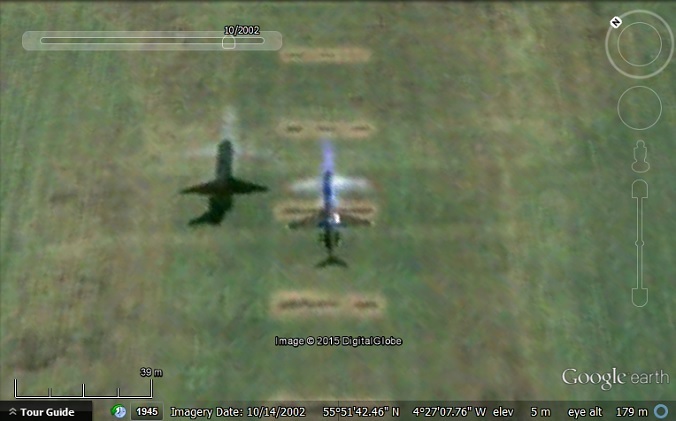 Google Earth Hacks has a couple of collections of aircraft in flight: civilian aircraft and military aircraft. Do our readers know of any more comprehensive collections? To find the aircraft featured in this post, download this KML file . Some more are here. In contrast to what that site says, though, there is no yellow filter: the yellow you see is the result of red and green combined. 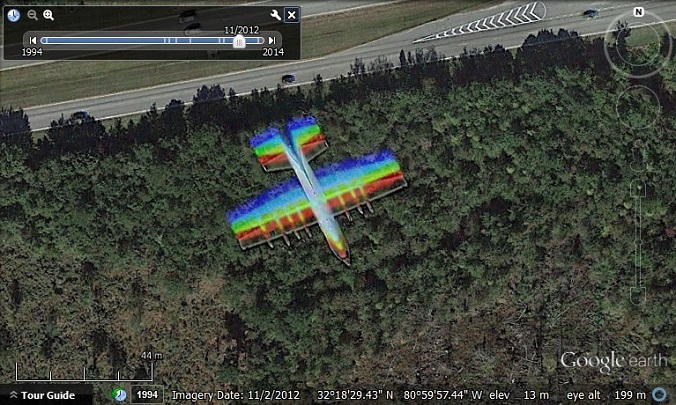 The official Google Earth Community has long maintained a collection of planes in flight. Frank used to contribute to it before his trip. The GE Hacks collection doesn’t seem to be very up to date. Has GE Hacks been abandoned?